Constructed from tough ABS plastic and weighing in at 18kg (just under 40lbs) the 250W12 is well spec'd and looks good in the flesh. It's heavy and certainly feels tough enough to take a lot of manhandling and sonic abuse. Packing in a 12" main driver for the mids and lows and a 1" horn, this speakers' nearest competition would be something like the Mackie Thump TH12A which comes in at almost £100 more. The 250W12 also rates at 500 watts (250 watts RMS), which is 100 watts more power than the Mackie. Included is an XLR mic input, a jack line input and an xlr out, plus there are controls for volume, high and low eq. In use the speaker really packs a punch, going significantly louder than the Mackie Thump 12, though the sound is quite coloured and middly when pushed and there's no mid range control to offset this. The built-in cooling fan is also on the noisy side but not over-intrusive. However, theres plenty of low end and at this price point you're simply not going to get a really transparent speaker. 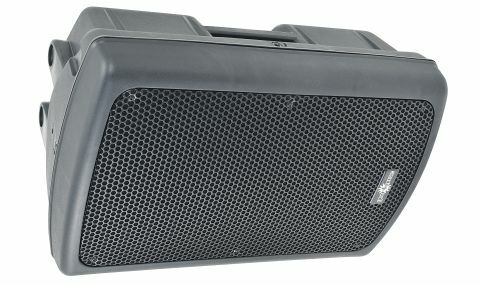 The 250W12 is certainly capable, plenty loud enough and great as a keyboard or vocal wedge, or as part of a PA for mobile dj's or in club installs. There are also rigging points, it can be put on its side, plus it has a pole mount and stacks with other 250W12's, making it a good choice for all sorts of PA scenarios. At this price if you don't need anything super-transparent but that instead packs a lot of power and sonic punch in a well-constructed cabinet, this is a very good buy. Also, if you are looking to buy a Mackie Thump TH12A, we would certainly consider the 250W12 a great alternative.